The skies on July 4th are alight with colorful explosions and roaring “booms!” If you love the fireworks shows that accompany the 4th of July, try some of these explosive recipes below. These firecrackers are ready to ignite your taste buds with salty savoriness. 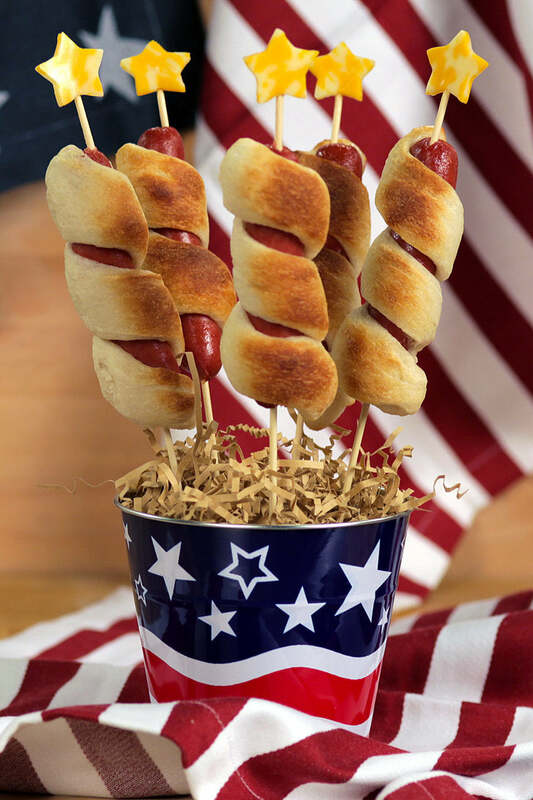 Baked inside of Crescent Roll pastry dough and topped with star-shaped cheese cut-outs, they certainly look patriotic. Serve them standing up like firecrackers and let your guests eat them while they’re hot. It’s something you can easily prep ahead of time and then pop in the oven during the party. Not all fireworks need to explode hundreds of feet up. Sparklers are a classic 4th of July pyrotechnic everyone can enjoy. While you’ll want to make sure this cake is on a glass plate (so it can’t catch fire), you can add colorful confetti to the outside for added pizazz. Make sure you light this cake outside! It’ll put off a lot of smoke that your fire alarms won’t like very much! Here’s a hint: if this is the grand finale of your 4th of July picnic, play the Star Spangled Banner in the background when you bring this cake out to gawk at and eat. 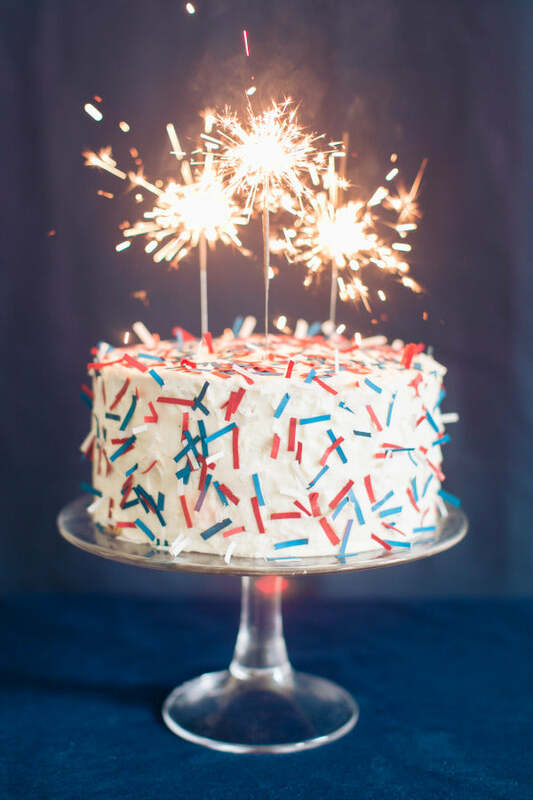 With white icing, food coloring, and clean paint brushes, you can create your very own firework cake! Just use sweeping strokes of watered down red and blue food coloring and create a firework design on the top of your cake. 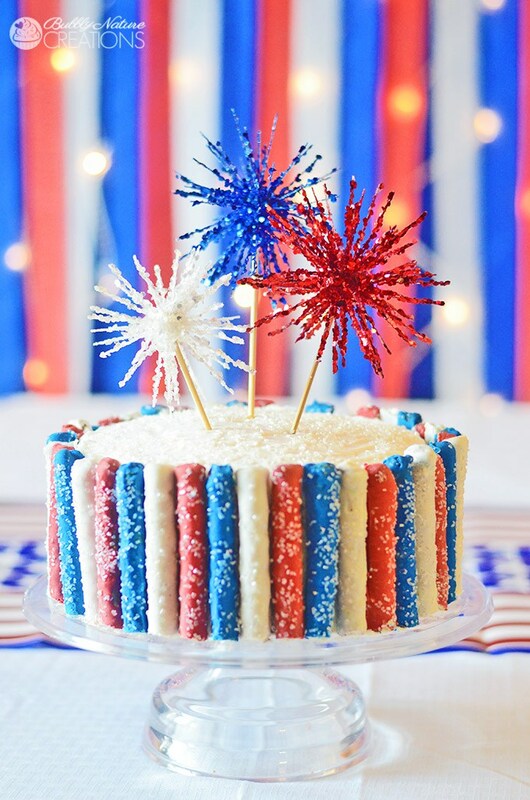 You can launch this into a whole new patriotic atmosphere by adding clear, sparkly sprinkles to the top when you’re done. The more it glimmers and glows, the more memorable it will be for your 4th of July party. 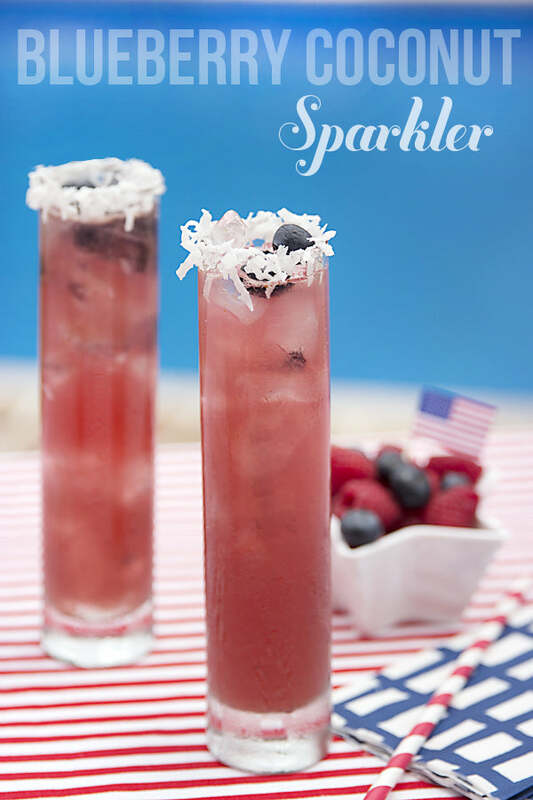 This sparkler isn’t on fire, but it is super bubbly and lively! Plus, it even has red, white, and blue hues that are appropriate on the fourth of July. Choose to make this alcoholic or non (or both!) so everyone at your Independence Day party can celebrate. If you love other red, white, and blue flavors more, you can also customize this cocktail to incorporate your favorite flavors. T-minus 3…2…1…lift-off! Set off your own rockets on the fourth of July without lighting a fuse. 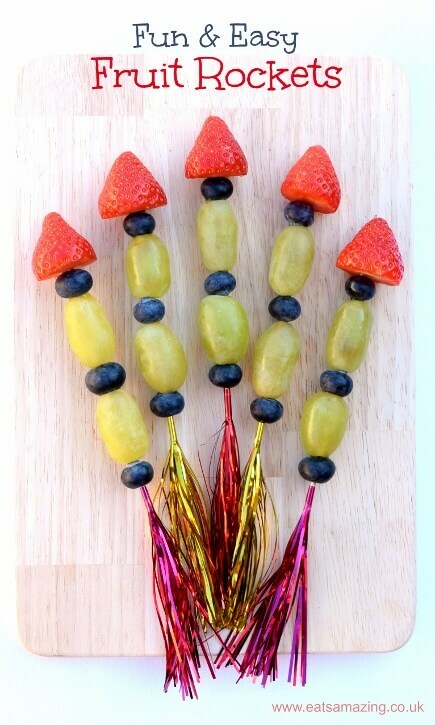 These fruit rocket skewers look thematic, but don’t require any of the potentially dangerous pyrotechnics as the other recipes do. Strawberries are best for the top, since they have the rocket shape, but you can use sweets, other fruits, and more on the rest of the skewer. Just follow the directions below to learn how to make the sparkly end of these cool fruit rockets. These are a bit more technical than the firework cake we showed you above, but they’re super impressive. If you’re a master of the kitchen and the arts, you should give this 4th of July cookie a try. You’ll need to treat the ingredients like paint to achieve this explosive look. Since the icing is hard, these firework cookies make great goodie bag stuffers for July 4th party guests! This video isn’t suitable for youngsters, but youngsters shouldn’t be making this anyways, so they don’t need to see it! Adults on the other hand can watch this video to learn how to make 4th of July Pop Rocks martinis to wow your guests on Independence Day. Just make sure you pick red or blue Pop Rocks to go with the patriotic theme. Then, get ready for powerful bursts of flavor in every sip that will light up your mouth with flavor and fun. There’s kettle corn, caramel corn, regular buttered popcorn, and now, Pop Rocks corn! 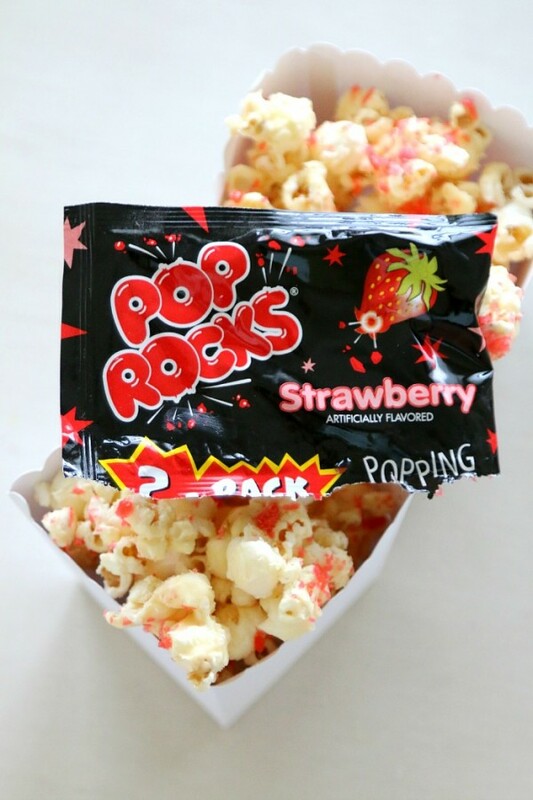 If you’re headed to a firework show and want to bring your own snacks, try this Pop Rocks popcorn. It travels well, has the sweetness and saltiness people love, and packs a firework-worthy punch into every bite. Put them in individual baggies with red, white, and blue ribbon, or share out of a tub! It’ll make you feel proud to be an American—and reader of this blog! This isn’t for drinking! 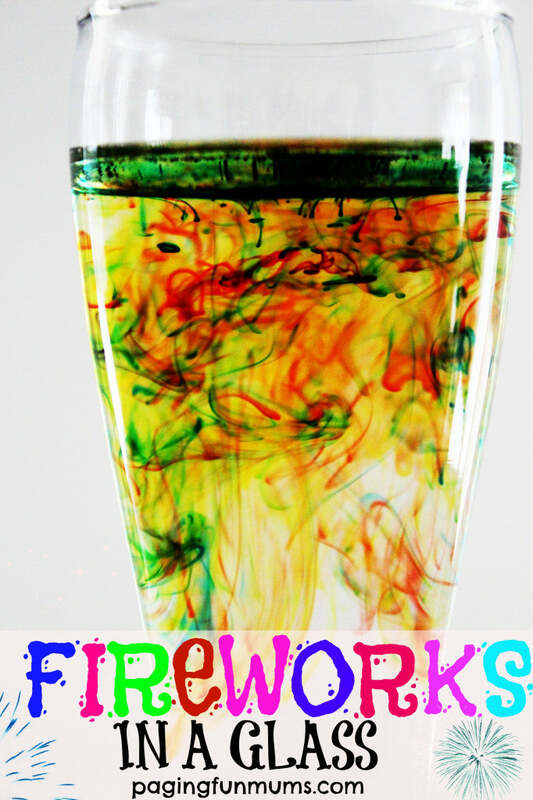 It’s a fun firework-esque experiment you can do at home with your kids. If you did want to turn this into an edible firework drink, use clear sodas or liquors and nix the oil. Although, we’re not sure how well it will work without the oil! That will be an experiment within itself. Regardless of what you do with it, you can use, red and blue food colorings to create your own fireworks in a glass and wow your kids as the colors mix. Not big on flambé? You don’t have to light your food on fire to celebrate fireworks on the 4th of July. Instead, use this firework pom pom as a decorative object on top of your cakes and desserts. You can buy these at any party store or make your own. Then, stick some into drinks for added patriotism or on top of a cake like the person did here. The energy these firework poms provide is through the roof!